Review: As the screening date for the live-action remake of Disney’s Dumbo was arriving I realized I hadn’t seen the original in probably two decades. Though it is classic Disney, 1941’s Dumbo is just not one that has ever made it on my rotation when it comes to revisiting the old classics. Plus, I still think I have traumatic memories of Dumbo’s Circus on the Disney Channel back in the day. So I decided to fire up the 64-minute chestnut and there were a few things that really stood out for me. One was the simplicity in the storytelling and animation – this is why movies becomes timeless because they are handled with a delicate touch that helps them transcend the years. The other thing was, slightly spoiler-y, but the dang elephant doesn’t even fly until the last five or six minutes of the movie. You remembered it differently, too, right? Now seeing that Dumbo isn’t one of my all-time favorites I don’t have the same precious feel toward it that I would have with, say, Cinderella, The Sword in the Stone, Pinocchio, or Sleeping Beauty. So I was less up-in-arms with Disney continuing their trend of turning their animated classics into live-action films…but more concerned with the guys they hired to do it. First up was screenwriter Ehren Kruger, best known for Scream 3 and a handful of the Transformers movies. What about his credits made it seem like he’d be the best choice to tackle the tale of a baby elephant at first ostracized for his large ears before being embraced when those same ears allow him to take wing? Second potential problem was the one time can’t-miss director Tim Burton, who hasn’t had a sizable hit for years and already biffed a major Disney adaptation with his brain-numbing bloated expansion of Alice in Wonderland. Then the first teaser appeared and it seemed like things may be going in the right direction. Showing just enough of those baby blue elephant eyes against the strains of the melancholy Oscar-nominated song Baby Mine hit audiences with the right dose nostalgia and the tide seemed to shift from uncertainty to curiosity as to how Burton would bring Dumbo and his circus adventures to life. Maybe Burton would go back to the type of fantastical creations that became his calling card in his early films before he fell into relying on a never-ending rampage of CGI world he’s been filming in for the last two decades. 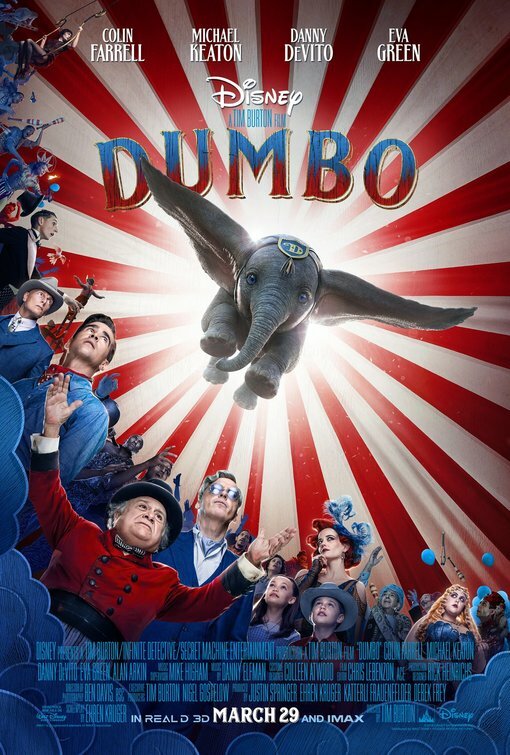 Sadly, Kruger (Transformers: Age of Extinction) and Burton (Big Eyes, Miss Peregrine’s Home for Peculiar Children, Frankenweenie, Dark Shadows) have not only run off with the circus in Dumbo but they’ve taken most everything you liked about the original with them. What they’ve given audiences (family audiences, no less) is a tale that’s too dark, scary, and frankly, boring. It also represents yet another failure by the studio to make any kind of case that these live-action remakes are somehow improving upon their source material. In fact, going all the way back to the Glenn Close led 101 Dalmatians, Disney has yet to totally perfect this formula…though 2015 lavish Cinderella came quite close. And it’s another Burton fiasco where an entire world is created on a soundstage rather than use the types of old-school Hollywood movie-making that used to set Burton apart from his peers. It’s all make-believe but there is no whimsy or fantasy to anything. It’s 1919 and the Medici Bros. traveling circus has seen better days. Led by Max Medici (Danny DeVito, The Lorax), the performers are weary of another season traveling on a shoestring budget yet they are happy to see trick riding sharp shooter Holt Farrier (Colin Farrell, Saving Mr. Banks) back from the war. Holt returns to his two precocious children (Nico Parker & Finley Hobbins) to be a father figure to them after the tragic death of their mother while he was overseas. Though he lost an arm in battle, Holt is eager to engage in his old act…if Max hadn’t sold his horses and most of his possessions already. Max suggests Holt work with the elephants, and it just so happens a new one has arrived and is due to give birth any day. When the baby arrives he causes an uproar with his oversize ears…as if any of these circus clowns and carnies don’t also have faces/features only a mother could love. How the baby elephant gets his name is one of the few clever bits Burton brings forth but too soon the kids have figured out Dumbo seems to take specific delight in flight whenever a feather is in his presence and we’re off on a very different movie. In the original film Dumbo doesn’t learn to fly until the final moments, in the 2019 version he’s soaring around the circus tent before the movie is ¼ finished. That leaves 75% of the movie for Kruger and Burton to expand Dumbo’s world and introduce new characters and, in some good news, excise those horribly racist crows. Michael Keaton (RoboCop) positively chews his way through every green screen Burton has erected as V. A. Vandevere, the scheming sovereign of Dreamland, a permanent circus that bears a striking resemblance to Walt Disney World with it’s multiple themed lands, wildlife on display, and cleverly concocted thrill rides. His star attraction is aerialist Colette Marchant (Eva Green, Cracks) and after seeing Dumbo in the local papers Vandevere sets his sights on purchasing Medici’s circus and establishing an act between Colette and Dumbo that will pack the audiences in. When Max, Holt, and the kids find out Vandevere has set them up only to gain access to Dumbo, it’s up to them to save the elephant and expose Vandevere for his greedy selfishness. This plot is directly from any number of family films (many released by Disney) so it offers little in the way of surprise or fulfillment. It’s hard to believe Disney executives green lit something so pedestrian, actually. Considering this is the studio that also has live-action remakes of Aladdin and The Lion King still coming in 2019…I’m worried more than ever about how those films will turn out. As for Dumbo, this is mostly disappointing because there was potential here to make something with more appeal and charm. Aside from the CGI elephant, there’s a seriously lack of personality anywhere to be found in the movie. DeVito seems like someone wound him up with a coffee IV and let him go while Farrell (who looks more handsome in clown make-up than he has any right to) is almost completely disengaged with the action. It doesn’t help the two tykes playing his kids are not only struggling to hide their British accents, they also are incapable of pulling empathy from an audience with their pallid line readings. Green, as always, feels like she wants to do something wild with her character but is operating within a framework that doesn’t support that. There’s no depth to anyone here, least of all in their choices or actions which are wholly dictated by the screenplay not by any real passion. If you’re looking for any hold-over moments for the original, you’ll be disappointed to know that most of the music has been replaced by Danny Elfman’s same-sounding score. There are hints at the original tunes but maybe the biggest sleight of all is the beautiful lullaby Baby Mine delivered by a ukulele strumming carnival worker as a campfire dirge to no one in particular. Admittedly, the Pink Elephants on Parade sequence has made the transition into the remake largely intact, this time as part of an impressively trippy Dreamland circus act. When all else fails, there’s Dumbo who will likely charm the pants off you and nearly made me forget how crummy the rest of Burton’s film is. Synopsis: From Disney and visionary director Tim Burton, the all-new grand live-action adventure expands on the beloved classic story where differences are celebrated, family is cherished and dreams take flight. 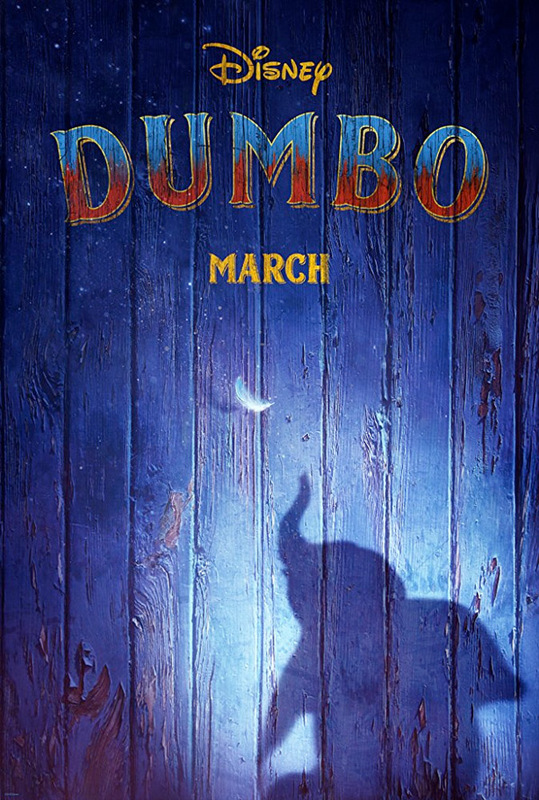 Thoughts: I must say when I heard Disney was making a live-action version of their classic 1941 animated film Dumbo to be directed by Tim Burton I was less than thrilled. Dumbo is a family favorite and one that seemed unlikely to lend itself to the kind of success other adaptations like Cinderella, Beauty and the Beast, and The Jungle Book enjoyed. Even more, was the dark whimsy of Burton (Dark Shadows) really the right choice to take this simple and lovely tale to the big screen? After watching this first look at the 2019 release, I’m relaxing into the notion that this marriage of Burton’s style and Disney’s chestnut might not be so strange after all. It looks downright charming. Starring Colin Farrell (Saving Mr. Banks), Michael Keaton (Spider Man: Homecoming), Danny DeVito (Dr. Seuss’ The Lorax), Eva Green (Cracks) and a big-eyed CGI elephant who is destined to fly to great heights, this just jumped up a few notches on my radar. Synopsis: An unemployed single mother becomes a legal assistant and almost single-handedly brings down a California power company accused of polluting a city’s water supply. Review: Though Roberts had been nominated twice before for an Oscar (for Steel Magnolias and Pretty Woman), it was her loose performance as the title character in this David vs. Goliath true life tale that finally brought her an Academy Award…and it remains some of her best work. While Roberts gets much of the credit, you can’t forget the strong support she received from Albert Finney (Skyfall, The Bourne Legacy) as her boss, Susannah Grant’s snappy script and Steven Soderbergh (Side Effects, Magic Mike) sitting in the director’s seat. Brockovich was an unemployed single mom when she fast talked her way into a job at a small law firm headed by Ed Masry. Though she didn’t look the part and definitely didn’t talk the part, Brockovich became a valued asset to the firm as she became a champion for the case of a town affected by the deadly dumping of toxic chemicals. Roberts is on fire here…you can tell it’s a role she believed in and a director she had faith in…and it all comes together to be a very satisfying picture. Some have argued that it was Roberts popularity in (and money-making for) Hollywood that helped her win but this is exactly the kind of role that the Academy is known to eat up. And who doesn’t love a good old fashioned tale of the little guy/gal triumphing over evil?